Не все репутации должны быть достигнуты на одном персонаже, можно делать каждую репутацию разным все равно будет засчитывать в это достижение. Can this quest be broken up by my alts? Or do I have to reach revered on one toon? Completing Дипломат Расколотых островов, does that unlock the Suramar mythics for alts? Or has each and every alt need to reach 8k honored with Nightfallen through the quest series/wq aswell ? I will reach Revered with every faction within 1 hour, i'll update the post if the achivement goes over to my other characters. This took me near full Loremaster(I don't have the last quest for Nightfallen yet) and 519 World Quests to achieve. I did end up about 6k into revered on every except my triggering faction which was Wardens. Wardens is annoyingly slow. Accomplishing this quest gives the Blue outline in your tracker. 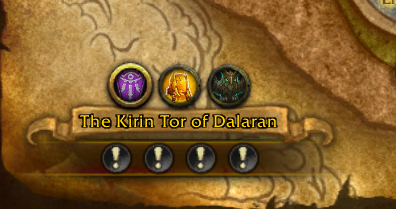 This dictates that the achievement is Bind on Account and applies to your alts. Not all reputations must be achieved on one character. You could do each of the reputations on a different character and it would still apply to this achievement, as it is account-wide, not character-specific. very disappointing and just plain wrong what they have done here. what has flying got to do with reputation? zero, zilch , nothing. Flying should be offered for a very expensive price at maximum level, non of the mumbo jumbo clap trap these devs babble...its us paying for this game , without us they have no game, and no subscription income..a tiny minority didnt want flying, so democratically what do they do? side with the tiny minority in north america...when pretty much the entire community wanted max level flying for a price. Rep grinding is nothing but a scam...it's not new content in the slightest..its not a new expansion...its you wanting to wrap your head around a post and kil yourself from pointlessness of it. Yet you you have to grind your knuckles to the bones....lest anyone forget most of us leveled new characters up to maximum level and many alts...we are tired of the mindless and pointless grind..and it should not exist for flying..its simple. Completed on patch 7.3.5, just commented to say that that this achievement can be split up and completed across multiple alts, even though all other sources including GM's say it has to be done on 1 character. Broken Isle Diplomat is an appropriately name achievement. Why oh why, oh Old Gods WHY is the Wardens part of the rep grind for flying? I can see the point of the other factions and don't mind doing the world quests for them but why the Wardens? They're so much harder to grind for seeing as there is basically no content besides the very few world quests. I can see the point of doing everything else and wouldn't have minded things like opening the tomb or invasions being part of the requirements because that all makes sense from a story perspective. I wouldn't even mind so much if you could run dungeons to get rep or something similar but why TF is this one pointless and unnecessarily difficult faction part of the flying requirement? Добейтесь того, чтобы вас почитали перечисленные ниже фракции Расколотых островов.